Why are my Pins not publishing to Facebook or Twitter? Are your Pins not properly publishing to Facebook or Twitter? Try this troubleshooting guide. Trying to use our handy dandy "Post to Facebook" and "Post to Twitter" features, but not seeing your Pins posting when they should be? Try these tips to help. Tailwind uses Pinterest's connection with Facebook and Twitter to post Pins to these platforms. This means that after you have scheduled a Pin on Pinterest (and checked for it to go to Facebook or Twitter), when it is time for that Pin to publish Tailwind will send a notification to Pinterest and then Pinterest will post that Pin to the social platform. First, Lets have you confirm the sharing permission with Facebook. If this is your first time sending a Pin to Facebook, you'll need to give Pinterest sharing permission before sending your scheduled Pins to Facebook. To do this, Pin something on Pinterest and click the "Post to Facebook" checkbox. 2. Pinterest will ask for permission to post to Facebook for you. Just click, "Okay" and your set! Note: If your queue's Facebook and Twitter share options are disabled, simply Reconnect your Account so that we can sync your latest settings from Pinterest. 3. If you have already done this, try repinning a Pin directly on Pinterest and selecting "Post to Facebook" (Without scheduling through Tailwind) and see if the Pin shows up on Facebook. Trying to publish to a Facebook Business Page? 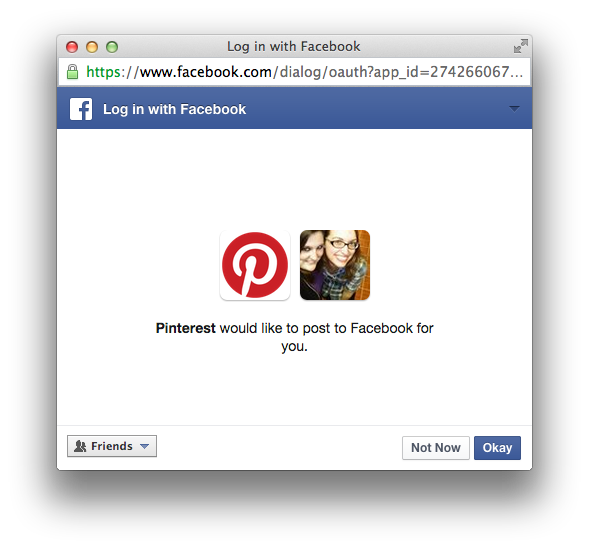 Pinterest currently only supports connections to Facebook personal accounts. This means that you are unable to send your Pins to your business page on Facebook. Until Pinterest can support both, publishing to a Facebook personal account will be the only available option to send Pins to Facebook. If you have tried all of these steps and you are still not seeing your Pins publish to Facebook or Twitter, we highly recommend reaching out to Pinterest. You can contact Pinterest at the Pinterest Help Center.